Why can't I open the zipper on my Bean Bags? Have you recently purchased a bean bag and noticed that the zipper had no handle? While it may look like this is a product defect, the fact is that the Australian Competition and Consumer Commission (ACCC) has regulations that require bean bag manufacturers to omit the tab. This handy guide will provide some background information related to the regulations and outline how you can get that childproof bean bag zipper open. The ACCC states that an opening through which a person could gain access to the interior of a bean bag should have a childproof mechanism attached. The reason bean bag zippers have no tab or handle so that it is more challenging to open the zipper. A more complicated locking mechanism is occasionally used to keep children from opening the bag. A bean bag is any bag that is filled with small beads or other particles. The regulations apply to both indoor and outdoor beanbags, and manufacturers of beanbags that are intended for pool use must comply with these regulations, as well. The regulations are set in place for a reason. While consumers may do their best to prevent accidents involving bean bags, keeping the handle off of the zipper has been shown to reduce the possibility of injury. Children may suffocate if they crawl into a bean bag and are not able to find their way out while their breathing is restricted by the material and contents of the bag. Small children may inhale and choke on the tiny polystyrene beads found in a bean bag. This risk is particularly prevalent for children under the age of 3. Keeping children safe from the hazards of a bean bag is a noble intent, but how do you get into the bag when you need to clean the cover? Use these steps to pull a zipper that has no handle. Start by finding a paper clip or corn cob holder. A paper clip or corn cob holder will be the tool that you use to open your bean bag zipper. Insert the paper clip into the hole in the zipper where a handle would typically be placed. You should notice that the zipper can be moved at this point. Use the paper clip as a pull to slide the zipper up and down. You are now able to take the cover off for cleaning. Do not use force when inserting the paper clip through the zipper hole. Do not use lubricants to attempt to make it easier for the paper clip to slide into the zipper hole. 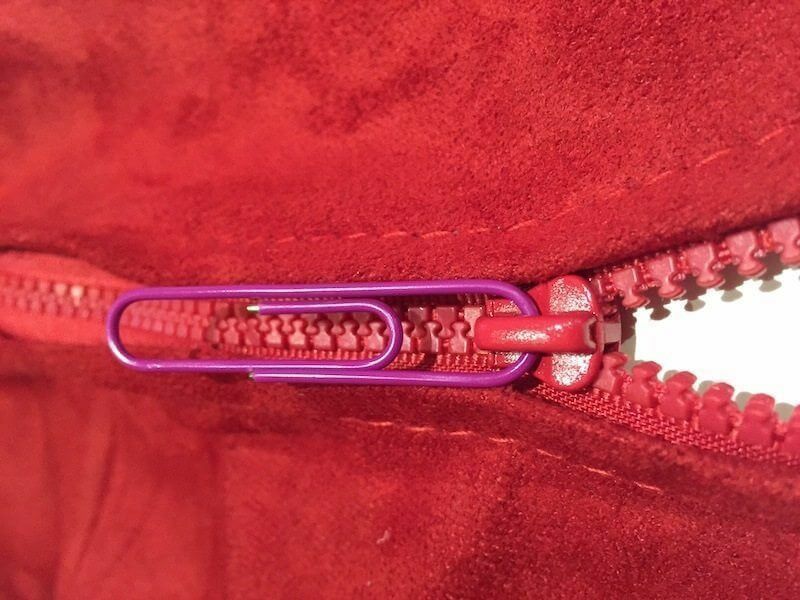 Ensure that the paper clip is inserted through the correct side of the zipper hole. Inserting the paper clip through the wrong side will not release the zipper. The steps mentioned above let you open a bean bag when you need to. However, it is important to remember to take the paper clip out of the zipper hole after you are done if the bag will be within reach of children. Suffocation and inhalation of the pellets in the bag are serious risks that have occurred in the past. The ACCC regulations that apply to the manufacture of bean bag chairs are intended to protect children from hazards that are potentially fatal. Use these tips to get the cover off of your bean bag when you need to clean it or inspect the filling.